A primary challenge in water treatment is removing contaminants at the molecular level that have formed electrically charged attachment to the water molecule. These attached contaminants are called suspended solids. 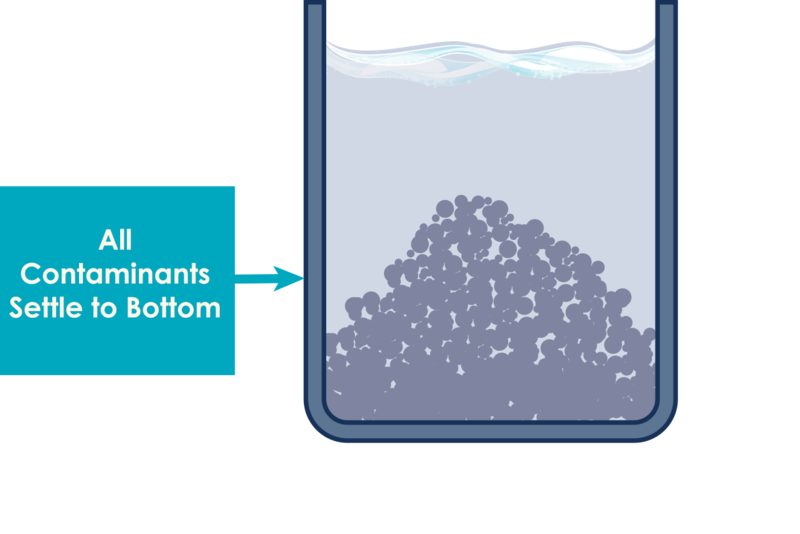 Without chemical treatment suspended solids resist separation, and even with treatment the contaminant’s bond to the water molecule takes time to deteriorate and release. In wastewater treatment a polymer’s job is to break the attachment of contaminant to water and to collect the solids. Amagel™ does the job of separating and collecting suspended solids from water faster and more effectively than industry standard methods, with lower material costs, less energy, and less space required. GC Solutions Amagel™ polymer technology was described by the executive director of the National Research Institute as an “elegant solution” to many of the problems faced in wastewater treatment today. Amagel™ has a proprietary netted structure that’s intentionally engineered to perform differently than long-chain polymers currently used worldwide in water treatment. Amagel™ captures suspended solids down to one micron, consolidating like constituents and allowing water and oil to separate and pass through cleaned of their contaminant bonds. The speed and thoroughness with which Amagel™ separates solids from water–coupled with its cost advantage, safe chemistry, and ease of use–makes Amagel™ a disruptive technology with capacity to redesign treatment equipment and procedures, and improve global water security. Amagel™ is a water cleaning polymer that combines the processes of coagulation and flocculation into a single step, reducing material and energy costs and rapidly dewatering without mechanical intervention. Amagel™ is activated by gravity and is the only known polymer with structural design to dewater on both horizontal and vertical plains. Amagel™ chemically de-bonds water and oil from suspended solids, soils and even sands. A one pound concentrated bar of Amagel™ treats one metric ton of waste water sludge . + Amagel™ rapidly binds and segregates a large variety of contaminants from water, including heavy metals and oils, at about half the material costs of other methods. + Amagel™ dewaters collected contaminants two to three times faster than the industry’s current best methods and virtually eliminates the need for dewatering equipment. + Amagel™ gravity separation of solids and rapid dewatering lead to lower energy demands and space requirements so both the physical and environmental footprints of processing are smaller. + Amagel™ enhances performance of other water treatment additives, and is adaptable to a variety of industries and applications that require water. + Amagel™ is easy to handle, transport, and use. It’s composed of non-hazardous chemicals, ships in low-volume solid form, and requires only commonly available mixing and injector equipment. Amagel™ has the ability to separate 200,000 times its weight in oil, grease, and other low-soluble organic compounds. The proprietary polymer can be injected upstream and downstream of separation processes, giving operators the flexibility to optimize the overall system performance and reduce costs. Amagel™ can be used as a cost-effective, one-step method for separating solids and fluids solely using the power of gravity. In many cases, it allows for a reduction or elimination of mechanical dewatering processes. Amagel™ can be used to pre-treat the influent of GAC filters, reverse osmosis units, ultra-filtration units, and other related systems where less soluble, high-molecular-weight hydrocarbons tend to cause plugging, fouling, and equipment contamination. Amagel™ can be applied downstream of oil/water separators, DAF systems, clarifiers, sand filters, and other physical/chemical separation systems. The dosage of Amagel™ varies with the concentration of solids in the sludge. It is NOT dependent on the type of sludge or the amount of water, oils, or other contaminates. Polymers and chemicals are used to coagulate and flocculate contaminants suspended in wastewater. Both treatments require mechanical mixing to activate chemical bonds between oils and solids, so waste materials cluster together and settle. These oily balls of waste clog mechanical equipment, increase maintenance, and slow down systems. Amagel™ causes suspended solids to flocculate, coagulate, and settle quickly. 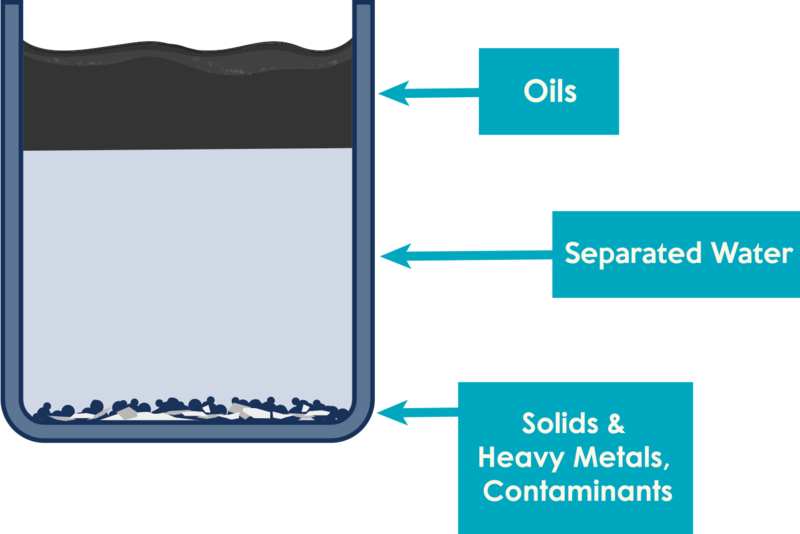 Clean water and oil naturally separate in fluid layers above the settling solids. If fluids are drained away, the remnant solid matter will continue to dewater until stiff or even brittle, so the waste is easier to remove, handle, and transport.